As a product manager (PM) of a web or mobile application, you want to ensure the application design offers the user experience (UX) that is not confusing and pleasant to use. A successful application helps your company's key performance indicators to go up. But how do you know if it is working in the field? In the design phase, you may rely on UX designer's knowledge and skills. During the internal test, you can count on your trained eye as a product person and your coworkers as test users. But the real test always takes place after the app is released. Let's be honest and ask ourselves. Are we following up to measure the post-release success objectively? If not, I suggest you to seriously think about taking action now. And record key user events It's not too difficult. Let's take an example of a travel booking app. Did you notice that on the first screen from the left, it says, "Our advice Buy" with an icon to indicate that the price will go up. Let's pretent that you are the PM and wants to test if such advice will drive the most important business goal: the sales. In fact, you even ran an A/B test to see if "Our advice Buy" increases the number of sale closed, which is your product goal. The test came in positive, but the increase of sales was not as much as you had expected. What is going on? Assuming there are more users persuaded to buy the ticket by the recommendation than the actual sales, you imagine several scenarios happening among users who entered the booking process in the app. Certainly there is a work for your team to improve the UX if the 4th and 5th are the big reasons. But you don't have a good visibility here. The distance is great in the observation between what you controlled (Whether the user is presented with "Our advice Buy") and the outcome (sales closed or not). There are many steps involved in between and you are not observing them. Imagine the fear and frustration of driving a car while you have to keep eyes closed for 5 seconds for every 5 seconds! That is your situation. To solve this problem, your application needs to "instrument" user events. In computer programming, "instrumentation refers to an ability to monitor or measure the level of a product's performance, to diagnose errors and to write trace information. ", according to Wikipedia. In this context, you want to log how the user interacts with the application. Where she tapped in the screen, on what page she closed the app, and etc. 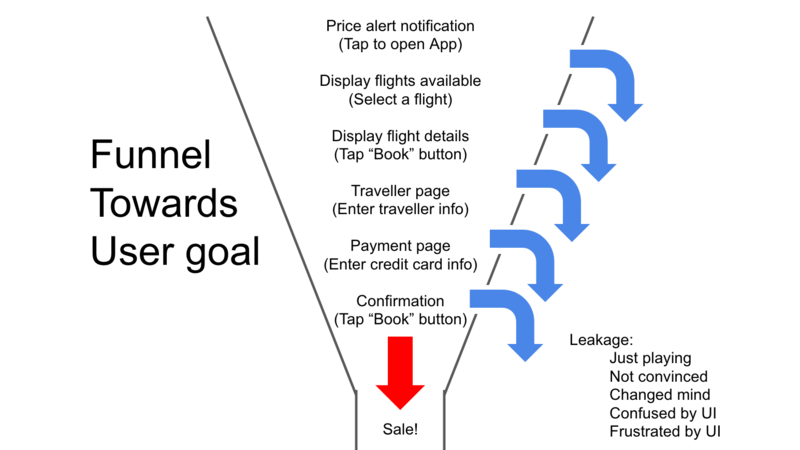 By carefully analyzing how the user interacted with your app, you may be able to infer the confusion and frustration that prevented user from achieving the user goal: Booking the flight. Unclear definition: You may end up hundreds of user event whose definition is not documented at all and you will never know if you are using the information correctly. Doesn't answer the question: If an instrumentation is not driven by a product question, it is very likely you need to redo the instrumentation once you have the actual question. The meaning of the event could change dramatically just by moving the logging code before or after a logical block. It is most likely do not match exactly what you want once you come up with a specific question. Cost: If you are using a service like Mixpanel, it will dramatically increase the bill while you are not looking back 99% of the data. It's a waste of money. You need to select the user events wisely. How to select key user events? At the beginning of the booking process, the number of users interacting with the app are much higher than the number of users completing the user goal of booking flight (or sales). So the top is wider than the bottom, therefore the funnel analogy. Just notice that the funnel is a leaking funnel. For every page in the app, latency, and expected user input, there is a risk of the user falling out of the process. The user inputs that carry the user to the next level in the funnel. The user inputs such as cancel button and timeout that indicate why the user is falling out of the funnel. Those will become the minimal set of user events for you to start understanding what is going on. 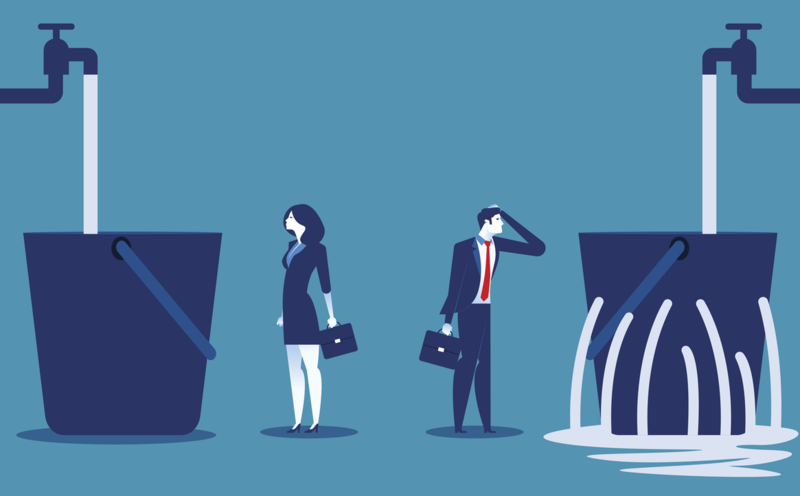 Here, you need to pick the Distinct ID of 1234 and thread them in order to identify where the user is dropping off from the funnel or completing the user goal. It would also be helpful if you include additional attributes such as Experiment Group in the example to group the user of the interest to see there is a difference in the performance. The number of the users who start typing traveler information is higher among the treatment group in which they are presented with "Our advice Buy". The effect seems to be much bigger than what you first observed in the final number of sales during the original A/B test. Most users actually finish typing in the traveler, payment information and click Book. But they are falling off at the confirmation step. They seem to be forgetting to click "Book" as the final step of the sales. By fixing the presentation issue of the confirmation page, you fix the issue of users forgetting to click "Book" button. In another scenario, there may be a bug in the fallback logic when the network is interrupted during the transaction call. After resolving the issue, the user presented with "Our advice Buy" started to perform much better in terms of the number of sales. The team is celebrating and you are glad that you now have a good visibility of the user interaction that gives you the actionable insights. Instrumentation of user event is a powerful product analytics tool. There are many practical issues and techniques involved to implement effectively. If you need an expert help, please start feeling good by connecting me on LinkedIn or sending a message. Daigo Tanaka is the founder and principal data scientist at Anelen Co., LLC.